Despite the digitization of business today, most organizations continue to rely on paper hard copies to get the job done. As a result, companies continue to look for ways to manage the ongoing cost, workflow, and efficiency of using printed documents. Unfortunately, some strategies that have emerged as a way to do so have masked hidden costs and inefficiencies. 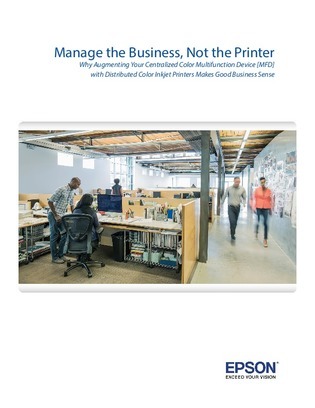 Access this white paper and you’ll explore shortcomings of a centralized printing approach that are often overlooked and discover a new class of business inkjet printers that make inkjet technology a viable alternative to color laser printers in office settings.